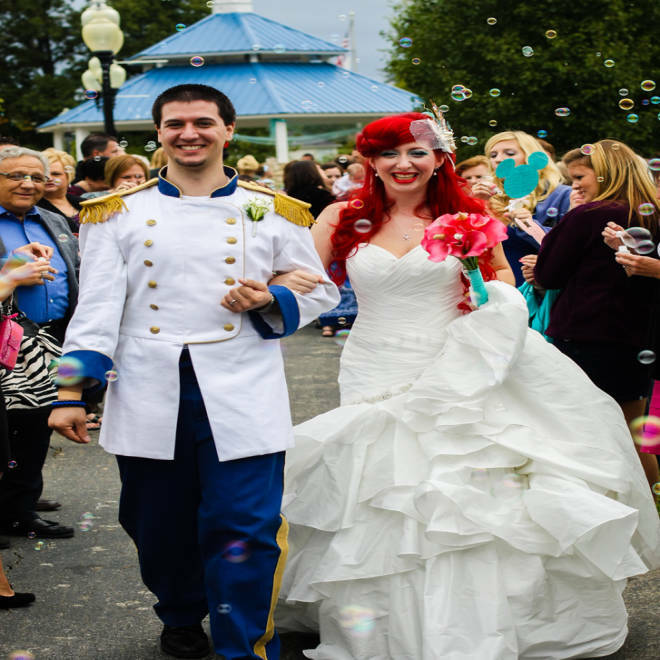 Jamie and Christopher Chandler, dressed as Princess Ariel and Prince Eric, prepare to exchange vows at their Disney-themed wedding. 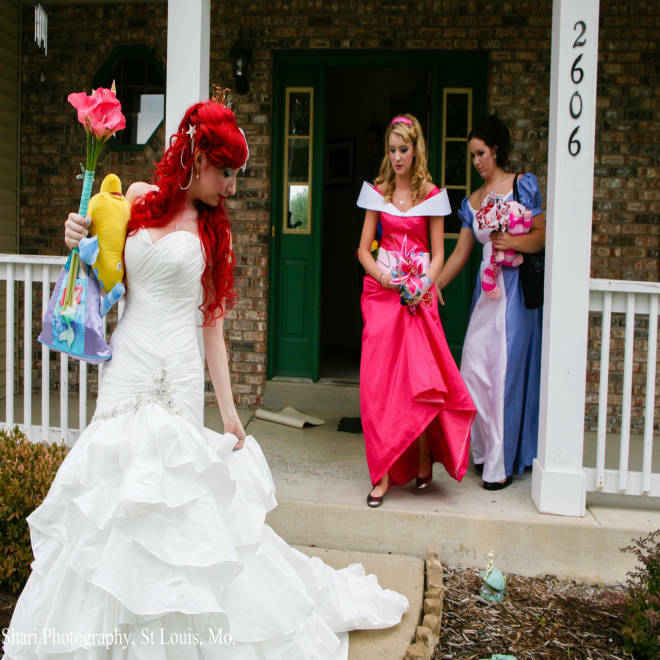 Many brides want to be princesses on their big day, but one young woman actually became one: Ariel, the little mermaid. 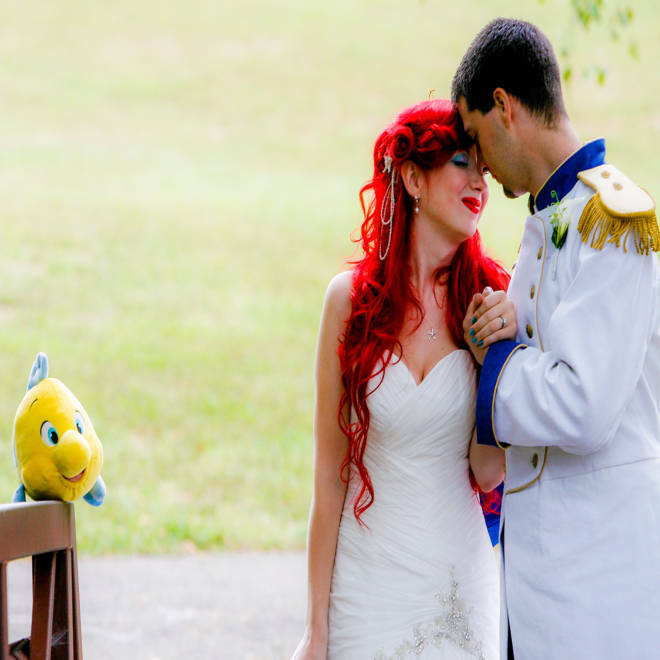 Aspiring actress Jamie Chandler, 26, loves Disney so much that her entire wedding was devoted to the studio's iconic fairytales, going so far as to embody her favorite redheaded character, complete with a stuffed Flounder bearing witness. It's an unconventional fandom, one that brought her together with husband Christopher, 27, also an avid supporter of the Magic Kingdom. "We both share a mutual love for the lightheartedness that Disney embodies," Jamie Chandler told TODAY.com. "Disney was a large part of both of our lives while growing up, and it is something that we both associate with family." Photos of the Chandlers' fall 2011 wedding, which were recently published online, went viral, with commenters calling it everything from "awesomely creative" to "crazy" to bemoaning "those poor unfortunate souls." 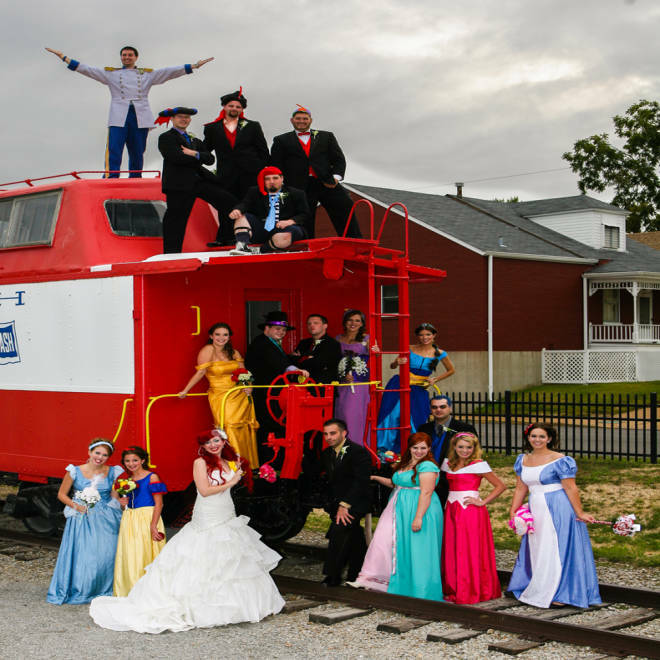 But for Jamie and Christopher, it was simply an obvious choice for the wedding – the O'Fallon, Missouri couple both grew up singing along to the animated musicals and regularly visiting Disney World, a tradition that extended into adulthood and ultimately into marriage. In 2009, Christopher got down on one knee at Disney World and presented Jamie with a glass slipper, which held an engagement ring. 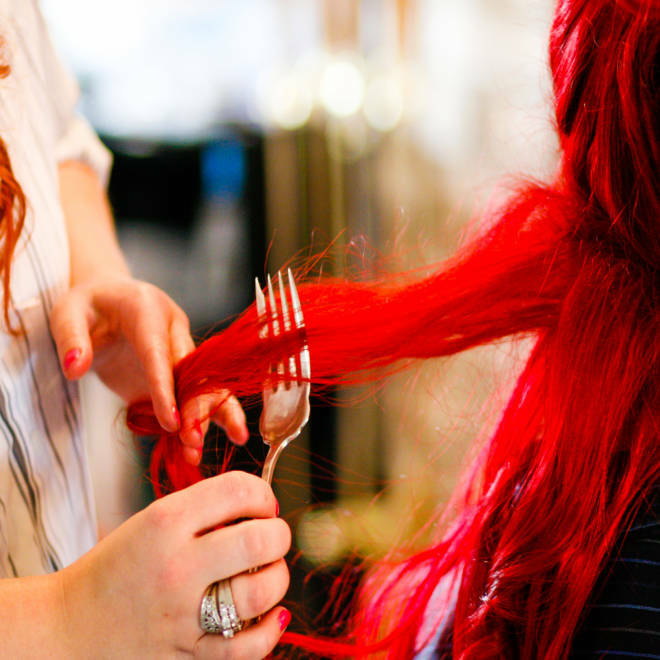 A "dingelhopper," also known as a fork, is a reference from "The Little Mermaid." Jamie's hair was swept up in seashells and fake seaweed. The regal bridesmaids look on as their princess departs to the ceremony. Jamie assembled her own flowers to cut down on costs. 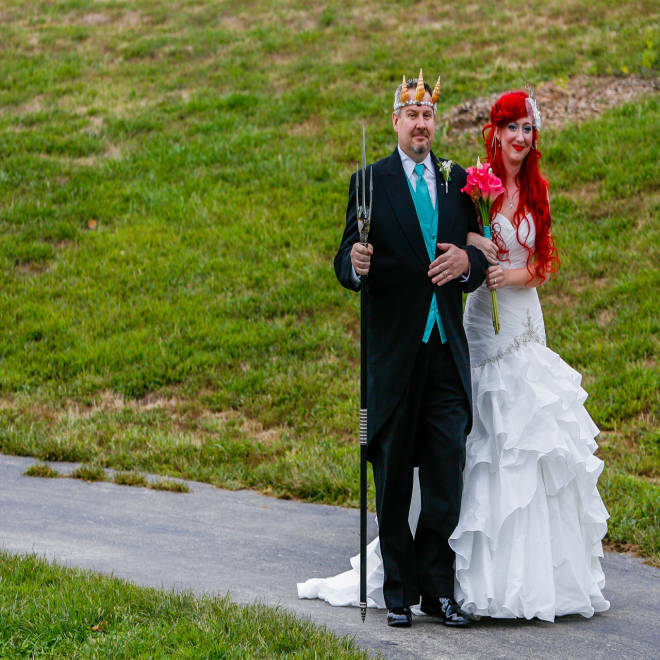 The bride's father dressed as King Triton to walk her down the aisle. 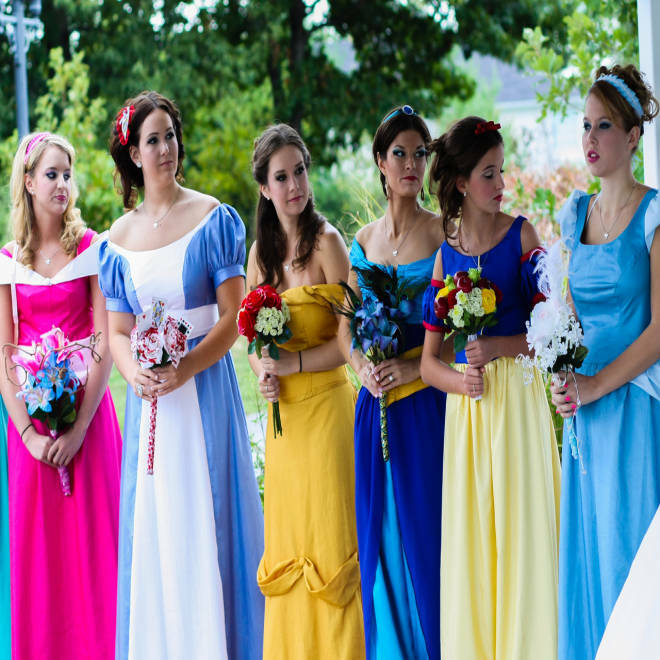 The bridesmaids' princess dresses were designed by the maid of the honor. 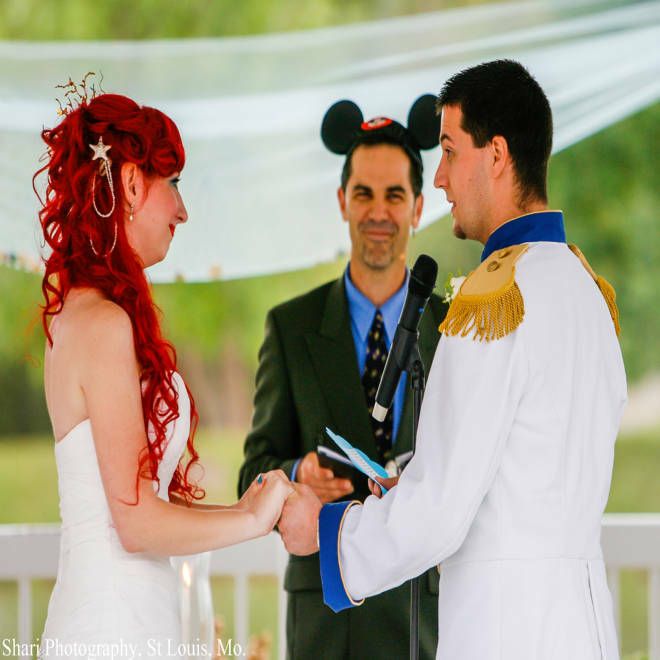 The ceremony was conducted by a close friend in Mickey Mouse ears. When it came time to plan their nuptials, Disney World seemed an obvious choice, but the couple lacked the means to invite all their friends and family. "We decided that if we could not go to Disney, then we would bring a little bit of Disney to us," said Jamie. "We wanted our guests to feel what it was like to be a kid again." The couple spent the next two years planning and saving up for their ultimate fantasy wedding, and worked hard to keep it DIY. 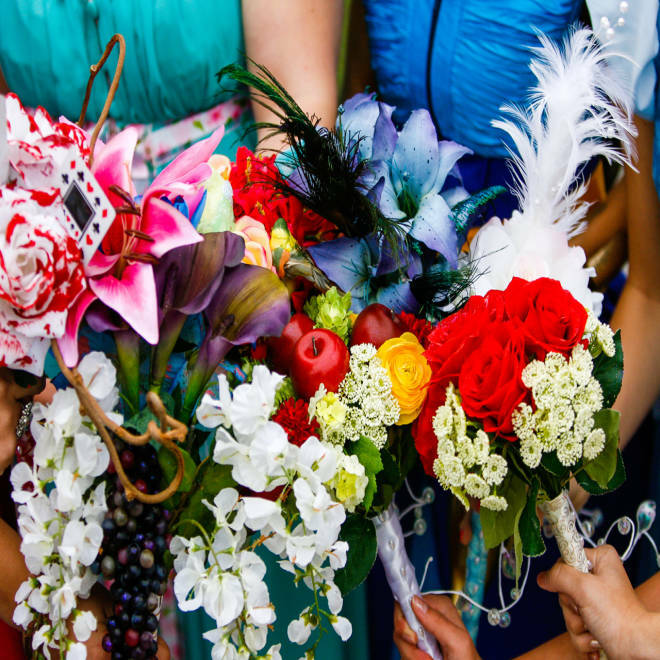 They crafted the centerpieces, invitations, programs, flowers and more themselves to keep costs down. Of course, they also got some help from loved ones. 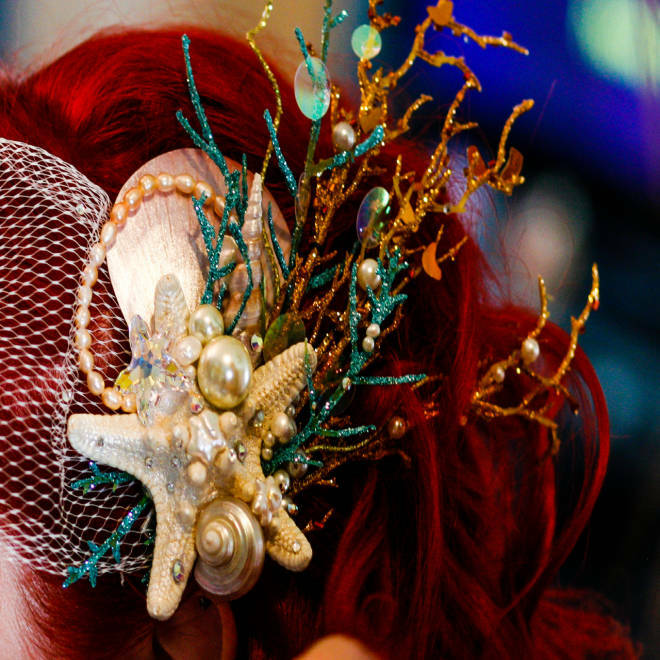 Jamie's father made his own King Triton crown, the groomsmen embraced their villain alter-egos, and the maid of honor designed all of the bridesmaids' princess-themed gowns. 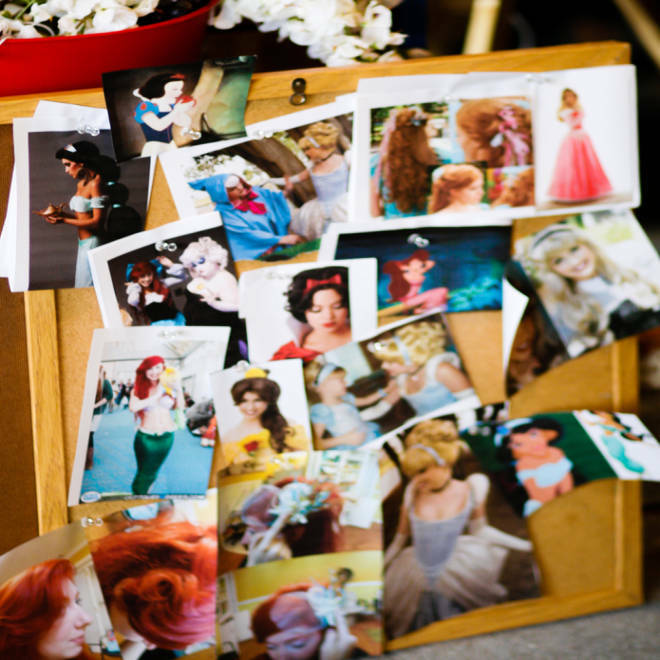 "We asked each bridesmaid who their favorite Disney heroine was and tried to take that into account when deciding who would dress as who," Jamie explained. The bride and groom, now married, are greeted by guests blowing bubbles. 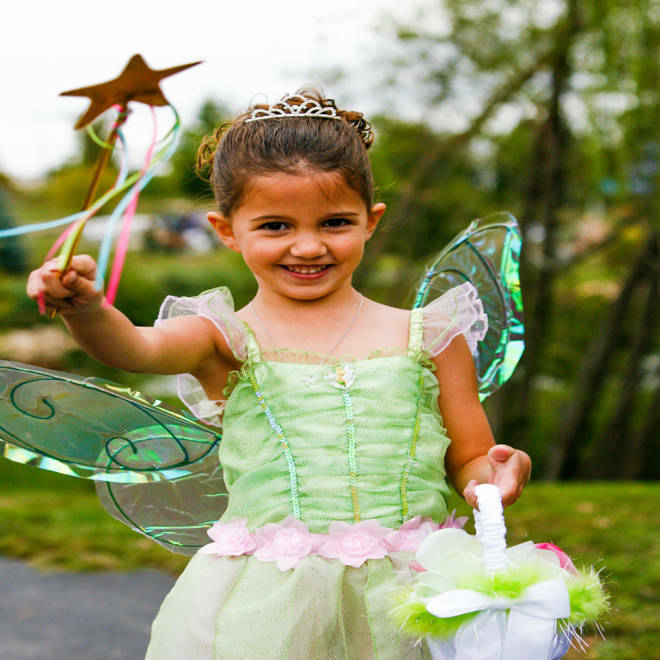 A young guest came dressed as Tinkerbell. "We both believe in Walt Disney's philosophy of always staying young at heart," said Jamie. 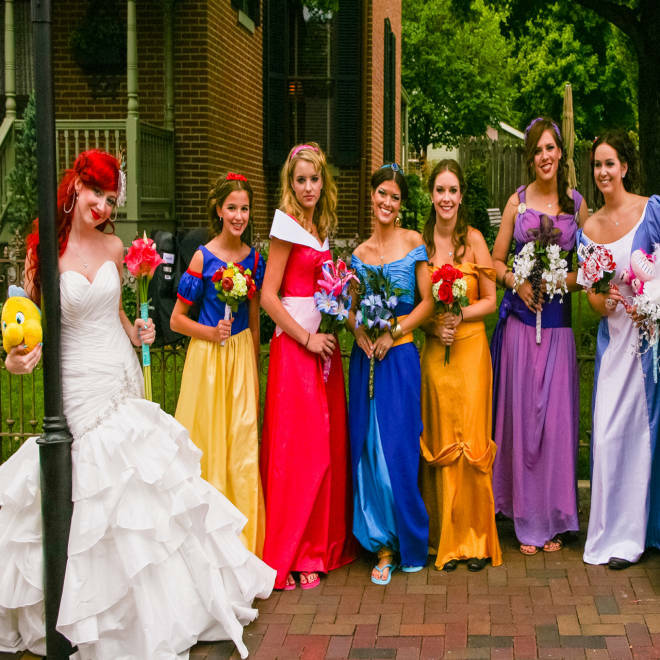 Guests who weren't in the wedding party were encouraged to don Disney themed attire at the reception, and the response was "overwhelmingly positive," said Jamie. "We received many compliments on the attire and the decor." 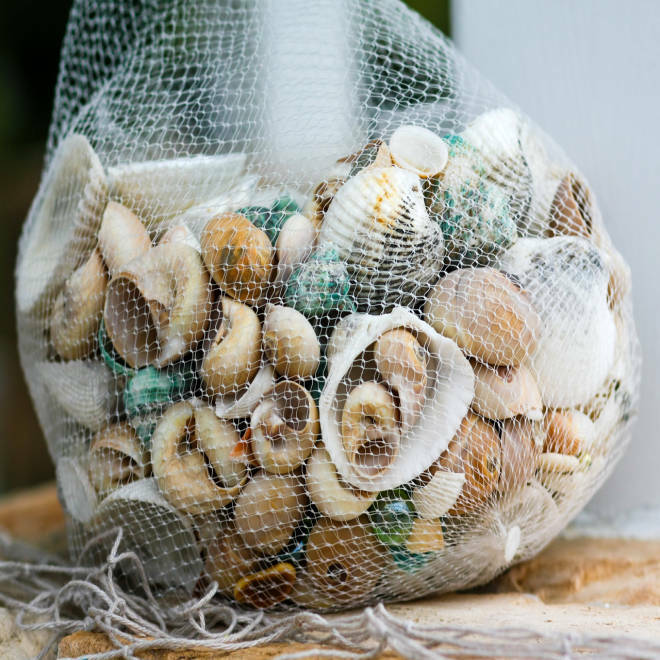 When the wedding day finally came, Jamie felt as if her dreams had finally come true. "There was not a single moment of the day that was any less magical than the one that came before it... Everyone dropped their guards for a few hours and allowed themselves to be childlike and to play, which is exactly what we intended." 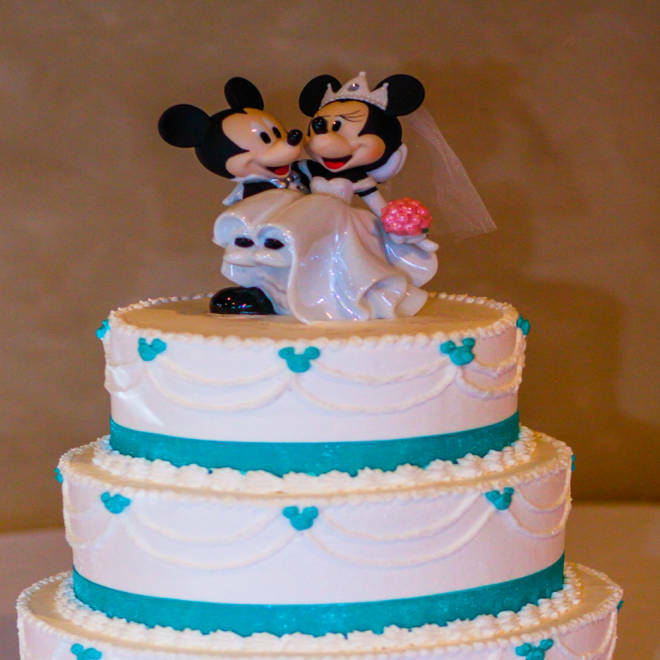 A Mickey and Minnie-topped wedding cake. 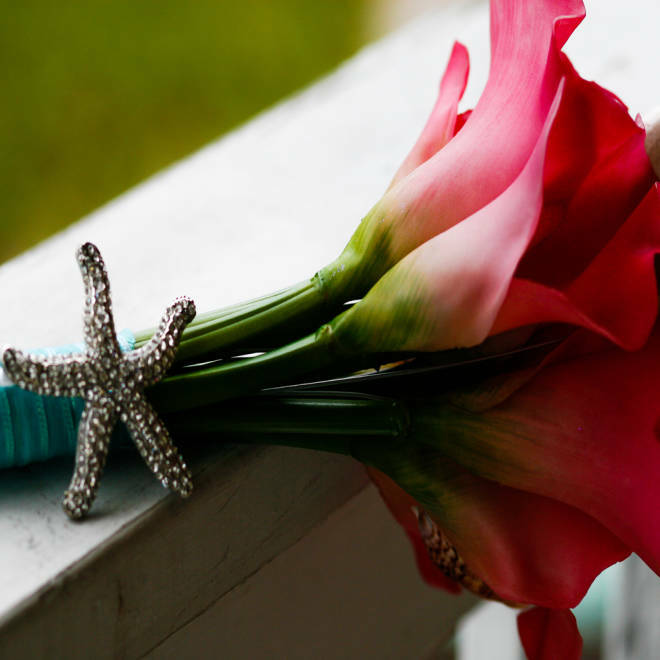 The couple made their own sea-accented centerpieces. 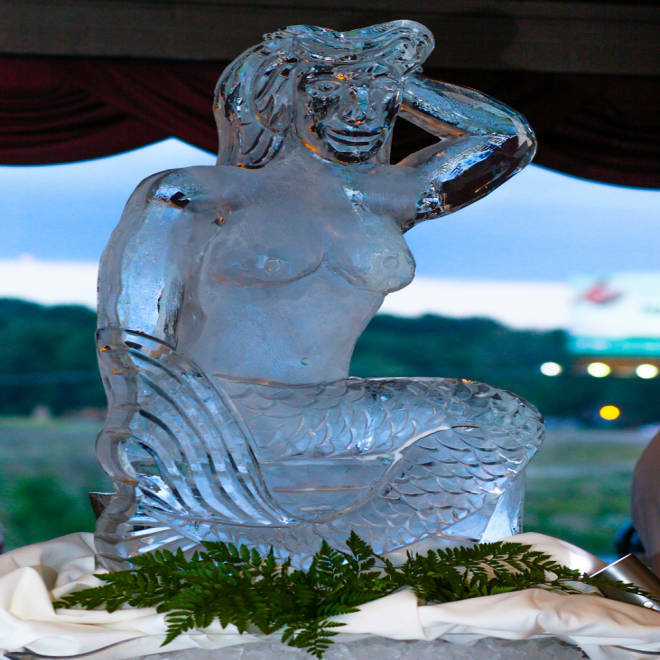 An ice mermaid takes center stage at the reception. "The reaction was overwhelmingly positive," Jamie said of her friends and family's involvement. The newlyweds intend on incorporating their Disney dreams into the future, with a possible relocation to Burbank, California – home of Walt Disney Studios – as Christopher hopes to work for Disney in "any capacity." But for the time being, the couple will make do with their favorite tradition: "We usually try to make it to Disney World as many times as we can," said Jamie. "It has always been our playground."